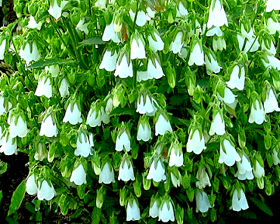 The pretty plant with broadly ovate, hairy, round-toothed, light green leaves produces mass of charming velvety, bell-shaped, white flowers. Blooming July-October. An easy, beautifull plant for rockery, border and also as a cut flower. Height 50cm. Sow seeds on the surface of the compost in spring. Make sure that the compost is moist but not wet and seal in a polythene bag until after germination which usually takes 14-28 days at 15-21C.